The Spilt Milk 2018 food line up is a sight to behold. Take a peek at our round up on what you can be feasting on below. Let the festival food frenzy kick off with Chur Burger. They’ve created unique ‘Spilt Milk Loaded Fries’ and a ‘Spilt Milk Burger’ just for us — tee’d up to be juicier than anything you’ve seen before. The Bao Brothers will be blessing us with their fluffy bundles of Gua Bao. Dishing up their all-time favourite pork, chicken and tofu bao in their ‘Bao 3Sum’ as well as a vegetarian trio alternative. Get stuck into Hoy Pinoy’s infamous traditional Filipino grilled chicken and pork skewers. You’ll be able to smell Hoy Pinoy before you see them, just follow your nose to the grill. If you’re looking for something back on the juicy tip, Dirty Bird will be flying in to dish up their unique southern style and crispy rice battered chicken burgers. And we can’t talk about whats juicy without talking about Biggie Smalls. They’ll be hopping into Spilt Milk to serve up their signature ‘KBabs’. For some delicious dough on the day you won’t be able to go past Happy as Larry, tossing fresh pizzas from their ‘Little Italy on wheels’. Speaking of dough, Emmy’s Gozleme will also be there to provide your compulsory festival gozleme. Hand making all their gozleme fresh to order, it’s impossible to be disappointed. The Avocado Hut have added their unique millennial menu to the mix with smashed avo on toast, avocado burgers and avocado with fries. On the other end of the spectrum, MEET will be delivering their wide variety of juicy smoked, grilled and charred meats. 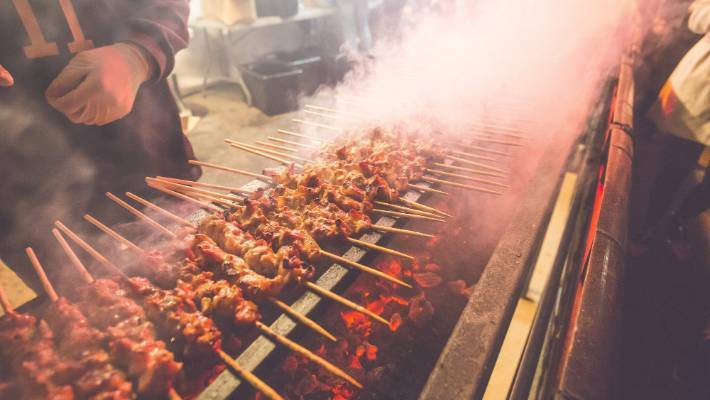 The Tsuru crew will be serving up their oriental style BBQ chicken and pork and Soothsayer Veggie Bar will flaunt their vegetarian and vegan toasted wraps. Smokin’ Grill Barbecue, Crackle & Co. and Cuban Cantina will be on location cooking up a feast. To throw some more Italian into the mix, you can visit Urban Pasta, Sofrito Paella, Fritto and Co. as well as Canberra local Jacko’s Pizza. For extra grease, Fricken, Rolling Schnitzel and Chef’s Kitchen will be on the scene and add a side of potatoes to top it all off from Killa Fries and Chips on a Stick. There’s something for everyone to feast on at Spilt Milk. The hard decision you need to now make, is where to start?